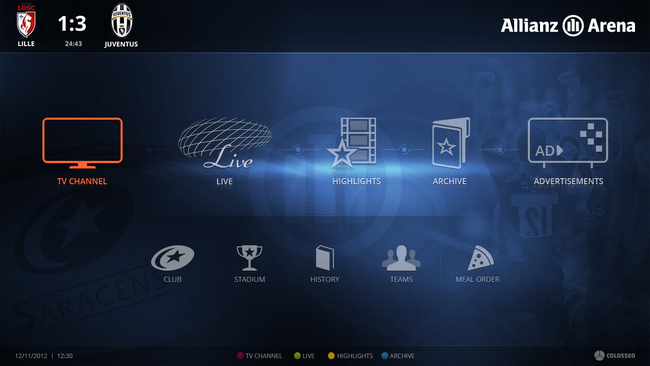 The Colosseo interactive IPTV (IIPTV) system provides unparalleled interactivity with standard LCD or LED TVs. It gives VIP suite guests a new view on events by providing alternative camera views and replays from all angles. The system can stream different content to individual screens, a group of screens or all screens simultaneously, making it easy to add varied content and multiplying advertising and marketing choices for stadium sponsors. The interactive IPTV system starts with a full-featured interactive screen interface controlled using a standard or venue customized remote control. 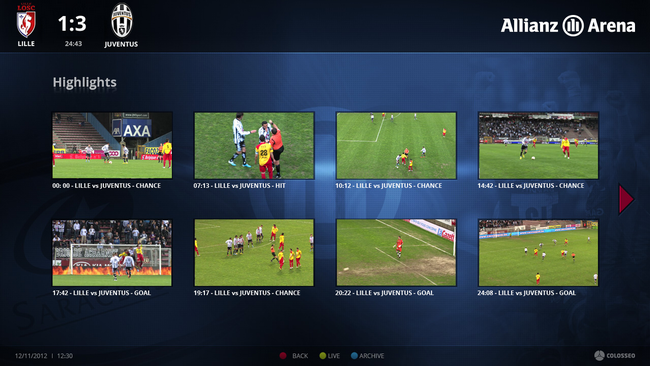 Fans can enjoy live streams, TV channels, game highlights from multiple camera angles, etc. We have moved boring channel changing on TV to whole new level by providing more content that visitors can enjoy, bringing a whole new value to VIP boxes. Screens in the concession area can feature live-game action, marketing campaigns for provided goods and services and a menu while screens in access hallways can mirror whatever is on the scoreboard.